The past century is full of progress paradoxes, with unprecedented economic development, as evidenced by improvements in longevity, health, and literacy. At the same time, we face daunting challenges such as climate change, persistent poverty in poor and fragile states, and increasing income inequality and unhappiness in many of the richest countries. Remarkably, some of the most worrisome trends are in countries with rapid economic growth and falling poverty. Not surprisingly, there is much debate about the sustainability of our future. Economic growth and the traditional metrics used to assess it—GDP paramount among these—are necessary but not sufficient to guarantee inclusive and sustainable growth in the global economy. Well-being metrics, which build from large-scale surveys of individuals and capture the income and non-income determinants of well-being, provide a different picture of what is happening to people within and across countries—stories the economic numbers do not tell. By providing insights into the kinds of policies that will sustain human welfare in the future, these metrics are important complements to income-based data. The U.S. has one of the wealthiest and most vibrant economies in the world. Growth has been steady for years, the stock market is booming, and unemployment is at record lows. 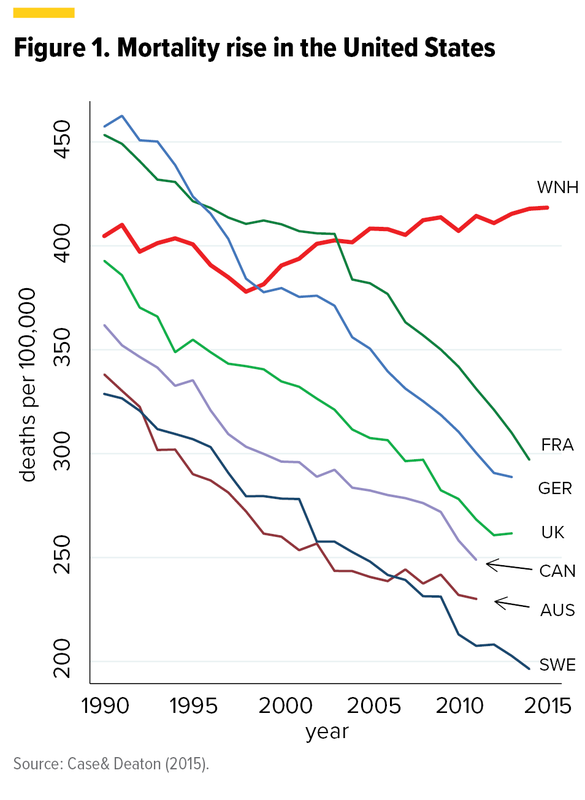 Yet life expectancy is falling—unique among rich countries—due to preventable deaths such as suicide, drug overdose, alcohol poisoning, and other preventable causes among less than college-educated whites, the traditional bastion of the American working class (see Figure 1). An increasing proportion of this group—15 percent of prime-age males—is out of the labor force altogether, a figure projected to reach 25 percent by 2025. My research with Sergio Pinto finds that these same cohorts report much less hope for the future and more stress than do poor African Americans and Hispanics, who face higher objective disadvantages. 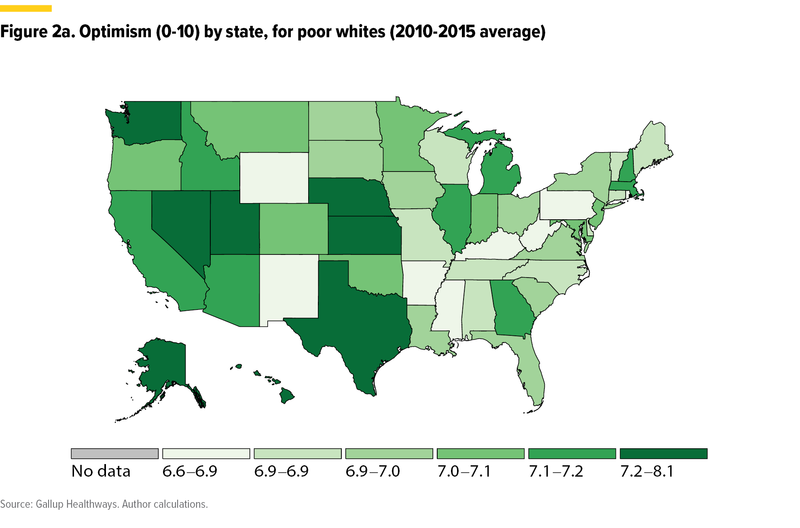 These markers of ill-being link closely to the individual and locational patterns in the “deaths of despair”, and minorities are much less likely to die of these deaths (see Figures 2a and 2b). This toxic combination has not only yielded a loss of welfare and productive potential, but has spurred the resurgence of nativism and support for anti-system populists who promise a return to the past. China is one of the most successful stories of rapid growth and poverty reduction in modern history. GDP per capita and household consumption increased fourfold between the years 1990 and 2005, and life expectancy increased to 75.3 years from 67 years in 1980. Yet in that period, life satisfaction fell dramatically and mental health reports and suicides increased, the latter reaching one of the highest rates in the world in the 1990s. The unhappiest cohorts were educated workers in the private sector, precisely those who were benefiting the most from China’s “new” economy. Long working hours and lack of sleep and leisure time were important drivers of this trend, as is deteriorating air quality due to increased smog and traffic. The most recent success story of rapid growth and poverty reduction is India, with extreme poverty falling from 38 percent to 21 percent from 2004 to 2011. Yet life satisfaction dropped significantly—10 percent or a full point on a 0-11 scale—from 2006-2017 (see Figure 3). Optimism about the future also fell at the same rate, although starting from a slightly higher level. Among the myriad causes are rising expectations, increasing income inequality, and tensions over gender rights. While both genders show a stark downward trend in life satisfaction, they do not reflect the gender differences in suicide rates. In part, this is a sad artifact of construction: life satisfaction surveys do not have scores for those who have taken their lives. Strong norms may also affect the response scales. Recent research, based on vignettes asking respondents to report their life satisfaction under alternative scenarios, suggests that women in places with strong gender discrimination report to be happier than they are due to low expectations (discussed in detail below). Again, rising unhappiness and ill-being coincide with the positive story that standard economic indicators and aggregate numbers are telling. Indeed, the increased suicides in the U.S., China, and India buck against trends in the rest of the world. 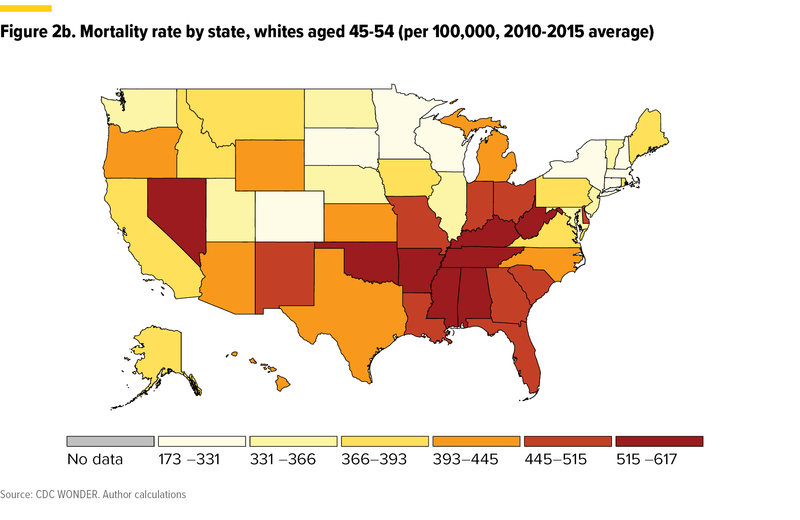 Suicide rates are falling elsewhere—by 29 percent since 2000, and are primarily concentrated among older people. In contrast, in the U.S. they are concentrated among the middle-aged and in China and India, among young women. In these countries, people are foregoing the prime years of their lives as many of their fellow citizens prosper. Do these paradoxes signal that our models of growth—and the lifestyles they result in—are out of touch with the realities and desires of the average human being? Is growth alone is not enough? Are current growth models sustainable going forward?